Brewer's Take: The 6-foot-11 Massamba has made great strides offensively this season in coach Dave Rice’s offense, often receiving the ball in the post and helping facilitate the offense. A big body underneath, Massamba has developed into a key part of the rotation after dropping about 15 pounds in the offseason. More importantly, he is one of the most popular players on the team because of his easy going personality. of Massamba and other Rebels. Massamba enters his fourth season as a Runnin' Rebel in 2011-12 ... Has appeared in 93 games and has started 23 ... Has averages of 3.5 points and 2.0 rebounds per game ... Has shot 64.0 percent from the field during his career ... Has scored in double figures in five games. Appeared in 32 of UNLV's 33 games and made seven starts ... Averaged 3.6 points and 2.2 rebounds per game ... Shot 59.7 percent from the field ... Scored in double figures in three games, including a season-high 12 points against Southeastern Louisiana ... Shot 5-for-5 from the field against San Diego State, scoring 11 points and grabbed a season-high six rebounds ... Averaged 15.0 minutes played per game. 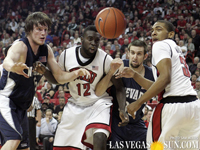 Started 16 games and appeared in all 34 of UNLV's contests ... Averaged 4.6 points and 2.4 rebounds per game ... Shot a team-best 73.2 percent from the field and shot 64.3 percent from the free-throw line ... Scored in double figures twice ... Led the team in rebounding in three games ... Started the first eight games of the season, then had a stretch from January-February where he started another seven straight games ... Nearly recorded the first double-double of his career when he scored 10 points and had a career-high nine rebounds in a win over TCU ... Shot 5-of-6 and scored a career-high 13 points against BYU in the MW Tournament ... Also had six rebounds in that game. Came off the bench and appeared in 27 games ... Averaged 2.0 points per game and 1.3 rebounds per game ... Shot 51.4 percent from the field and 63.3 percent from the free-throw line ... Scored a then-career-high eight points against Western Michigan. Attended Findlay College Prep at the Henderson International School in Henderson, Nev., from 2006-08 ... As a senior in 2007-08, he helped the team to a 32-1 record as the Pilots lost in the prep school national championship game ... Averaged 6.4 points and 5.2 rebounds per game ... Started all 26 games he played in, shooting 65.9 percent from the field ... Played for the Swedish Senior Men's National Team in the 2006 Euro Cup qualifying games and averaged 18 points, 10 rebounds and four assists per game at Gelstaviken Gymnasium in Sodertalje, Sweden ... Coached by Mike Peck at Findlay Prep ... Played with current Runnin' Rebel teammate Carlos Lopez at Findlay ... Also Played on the SBBK club team. Brice Massamba was born July 8, 1988, in Lubumbashi, Congo ... The son of Madeleine Lukolama ... Majoring in interdisciplinary studies ... Has three brothers, Dadhy (31), Darly (30) and Thomas (26), and a sister, Tanya (20) ... His brothers Darly and Thomas play basketball professionally.